Fourth Row Center: Film Writings by Jason Bailey: In Theaters: "Corman's World"
Early on, Stapleton finds Corman on the set of his latest producing effort—a SyFy original movie called Dinoshark. It is about, well, a hyrbrid dinosaur and shark, attacking people in Puerto Villarta. You get the idea. Corman is practical about the movie’s motus operandi: “We fell that the monster should kill somebody fairly early,” he noes, “And then at regular intervals throughout the picture.” Seems like sound advice. For that price, and with formulas tailored to the pop culture needs of their specific moments, his pictures filled a void—and the film has a keen understanding of exactly why his films connected. First and foremost, they reflected an of-the-moment anti-authoritarian streak which was inherited from their maker. Secondly, he seemed to have a direct line to teenagers—an audience that was being severely underserved. And third, he had an astonishing nose for talent. The Corman factory—whether he was farming out to AIP or running his own outfit, New Horizons—has become legendary for the sheer volume of fabulously successful directors and actors that learned the ropes there: Nicholson (whose wisecracks and astonishing emotion provide the movie its heart and soul), Martin Scorsese, Francis Ford Coppola, Ron Howard, Peter Bogdanovich, Jonathan Demme, John Sayles, Joe Dante, Dennis Hopper, Peter Fonda, Bruce Dern, Pam Grier, and on and on. Thankfully, Stapleton gets all of them to show up and pay tribute (except Coppola—and seriously, what the hell better did he have to do?). Lucky for us, when it comes to Roger Corman, paying tribute means telling stories. The stories that reverberate through Corman’s World are rich and funny and charming and ballsy. There is hilarious tale of how he scraped together The Terror, because he had a few days before the sets for one of his Poe films were torn down. (Nicholson’s digs at the final product are priceless). There is Peter Bogdonovich’s wonderful recollection of his first directorial job, shooting inserts for a foreign sci-fi picture re-dubbed Gill Women of Venus (aka Voyage to the Planet of Prehistoric Women), for which he was not afforded the luxury of location sound. Jonathan Haze remembers the one time Corman stopped a take for the shot-in-two-days Little Shop of Horrors—so that he could save the prop equipment he’d borrowed from his dentist. And there are the more sobering stories of the location shooting of The Intruder, Corman’s first attempt to make a serious social message movie, and his last. 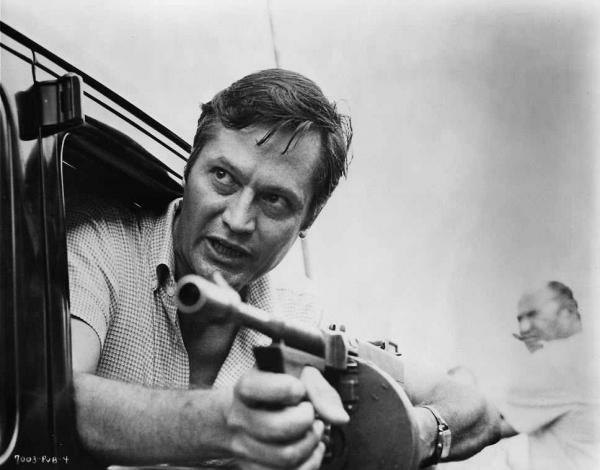 It was, as his brother (and co-producer) Gene Corman remembers, “the only film we didn’t make money on—and it was out best film.” Corman would never again sacrifice the exploitable elements that made his films so distinctive. His was, according to Paul Bartel, “an exploitation operation on almost every level,” one where directors knew “the genre notes that we had to hit,” per Allan Arkush. He would have to settle for smuggling in his social themes as subtext, buried within the tales of night duty nurses and killer piranha. That fear of failure, borne out by his solitary attempt to be a “real” director, answers the question that Variety critic Todd McCarthy poses as to why he never took the same leap into the big leagues that his alumni did. Stapleton trots out montages, good (there’s a terrific mosaic of those inimitable posters) and bad (the imagery of the turbulent ‘60s is pretty boilerplate stuff), and some nicely penetrating insights; we know, from docs like A Decade Under the Influence and Easy Riders, Raging Bulls how Jaws and Star Wars helped usher in the end of the “movie brats,” but I hadn’t realized until this film exactly what those pictures did to the exploitation market: they marginalized it, bringing exploitation subject matter into the mainstream and leaving filmmakers like Corman to crank out slasher swill. The last three decades are basically skipped over in Corman’s World, and that’s just fine, because they allow the film to arrive at the conclusion its subject deserves: a good old-fashioned Hollywood happy ending. Corman’s World is a wonderful picture, pure pleasure; it makes you want to go out and make movies. "Corman's World" opens today in New York and L.A.